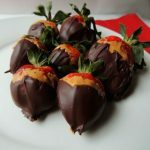 These peanut butter chocolate dipped strawberries are an easy to make dessert for Valentine’s Day, or for any peanut butter lover. Wash and dry strawberries, leaving top intact. Microwave peanut butter in glass bowl for 20 seconds. Dip a large spoon in peanut butter. Roll each strawberry in spoon to cover. Place strawberries on cooling rack, and store in freezer at least 20 minutes, or until peanut butter is firmed. Meanwhile, melt chocolate chips in double boiler or in microwave-safe bowl until smooth. Let chocolate cool 5 minutes. Dip each strawberry in chocolate, and refrigerate until served.